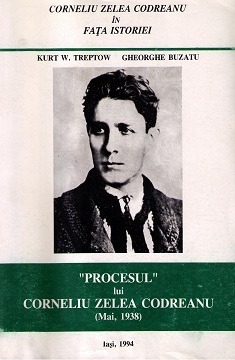 Rare Romanian language book (Procesul lui Corneliu Zelea Codreanu) presenting a critical historical document for twentieth century Romanian history, the transcript of the trial of Iron Guard leader Corneliu Zelea Codreanu in May, 1938. Rare Romanian language book (Procesul lui Corneliu Zelea Codreanu) presenting a critical historical document for twentieth century Romanian history, the transcript of the trial of Iron Guard leader Corneliu Zelea Codreanu in May, 1938. Includes an introduction by Gheorghe Buzatu and Kurt W. Treptow. Please note that this title is not available in English translation.